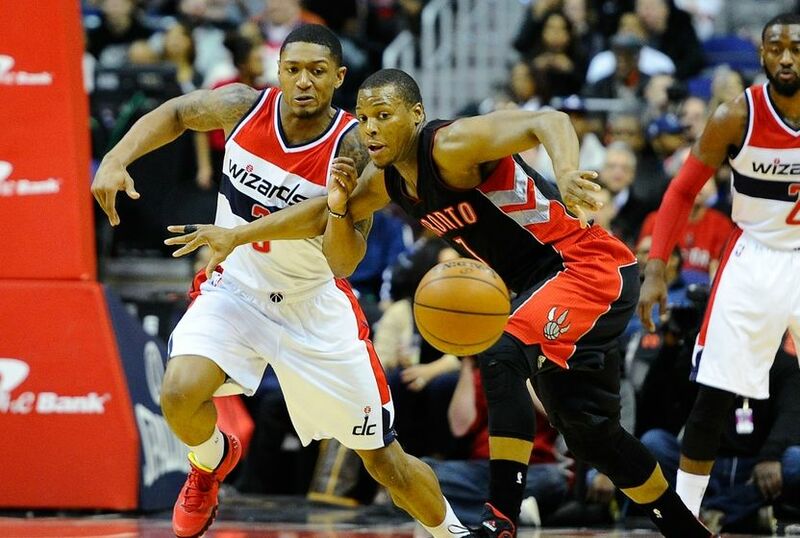 After starting out hot both the Raptors and Wizards flamed out early due to injuries and in the Wizards case, trades. The Wizards dealt with injuries in regards to shooting guard Bradley Beal and the Raptors dealt with injuries revolving around starting guards Kyle Lowry & DeMar DeRozan. After the Christmas break the Wizards dropped as a team while the Raptors were inconsistent in their approach as well. Toronto was a team that could win on the road as well as at home. They have up-tempo style of play and will usually push the ball following a rebound. Point guard Kyle Lowry is their best playmaker while shooting guard DeMar DeRozan is their best scorer in general. Off the bench the Raptors are led by 6th man Lou Williams (3rd leading scorer) and have guys like Greivis Vasquez, James Johnson and Patrick Patterson who can make plays as well. The Wizards weren’t that good of a team away from home and often struggled in games that required a lot of scoring. During the season Washington made a midseason deal with the Kings trading away backup point guard Andre Miller for another backup in Ramon Sessions. Like the Raptors, Washington plays an up-tempo style but they aren’t nearly as deep and can’t score in a half court set. These two teams met in the regular season three times with the Raptors winning each game.. (103-84, 120-116 OT & 95-93) The first and last time they met the games were in Toronto with Bradley Beal missing each game. The one time Beal did play against the Raptors they lost at home in OT. Throughout the season Toronto was a top 10 offensively while Washington was a top 10 team defensively. In the postseason, with the game being slowed down the Wizards have the advantage in that aspect. And despite not having home court advantage the Wizards have players on the roster who know how to win on the road (Pierce game 7 of last year Nets vs. Raptors.) and have ample playoff experience. John Wall is the best player in this series & he’s playing with a chip on his shoulder. If he can consistently get to the paint and create opportunities for his teammates they should be alright offensively. When Wall and Beal are sitting the bench needs to step up their play. Toronto has to lock in on defense if they want to beat the Wizards. Scoring and not being able to defend won’t warrant any type of advantage. If Lou Williams can continue his dominant play off the bench and keep the Raptors afloat offensively the Wizards will be in trouble. Prediction Wizards beat the Raptors 4-2. Wall and his team were in this same position last year when they played the Bulls without home court advantage. The Wizards played liked a team worthy of being an Eastern Conference finalist at the beginning of the season and I believe they’ll get back to that form in this series. I don’t believe in Washington. They had the refs on their side.